Rivers of Croatia - natural highlight of Croatia - Explore Croatia Become a Patron! Maybe no other European country has such diverse, yet so preserved rivers as Croatia. Adriatic coast is world-known, with crystal clear sea, rocky coastline with ancient stone towns like Dubrovnik…The sea is however not the only richness of Croatia. Its rivers are surely one of the most important values. From murky and slow lowland rivers that flood huge floodplains; through short and fast mountainous rivers that flush on rapids; then rivers in Karlovac region with travertine (tufa) waterfalls and slow, almost marshy parts with lush vegetation; quiet rivers in karst polje that are lost in the dark underground only to spring at other place; until big Adriatic rivers in deep barren canyons with waterfalls, that meet the sea in narrow estuaries like Zrmanja or wide delta-like Neretva. Since they are diverse and untouched they are oases of life containing preserved biotopes with rare and endangered species on the European level. 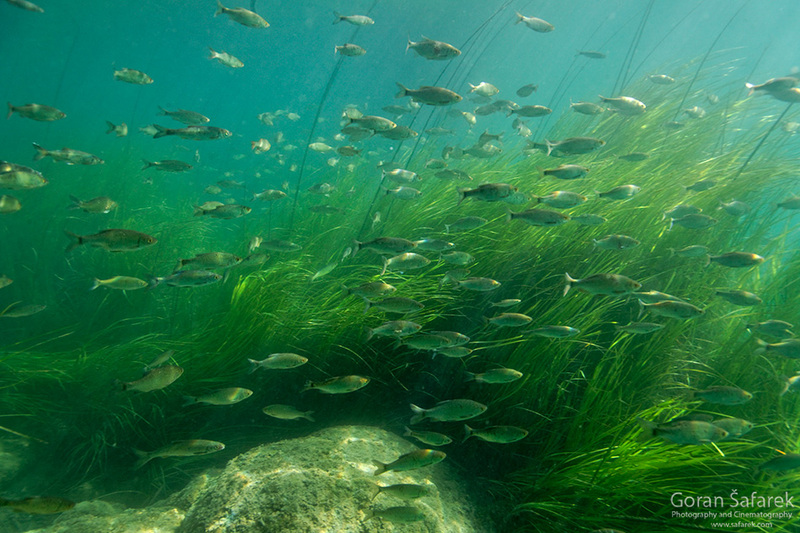 Because of their particularity, many endemic species live in them; among fish species in karst rivers around 15 are endemic. Rivers of Croatia are truly gem of the world rivers (see the blog about world rivers). Croatian lowland rivers flow through the plain of the former Pannonian Sea forming large drainage basins, such as the basins of the Drava, the Sava and the Danube. Some of them have kept their natural dynamics, so their riverbeds are constantly changing in space and time. A river deposits sediment (gravel and sand) on one bank, while eroding the other. The bend, or meander, grows gradually, until some unpredictable natural forces make it choose a new path leaving the meander behind, so it is cut off from the main flow and thus becomes a backwater or a pool of stagnant water. And that has been going on for centuries and millennia. 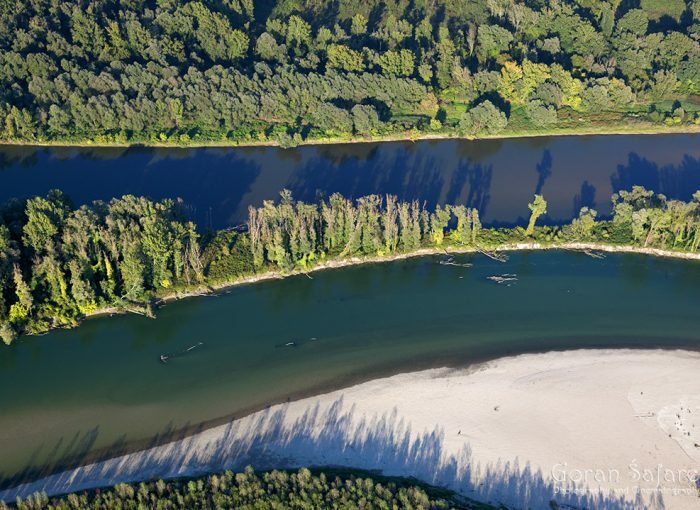 Croatian rivers, especially the Drava, have kept that natural dynamics. Great European rivers flow between concrete or stone banks for centuries, but ours are still alive. Some of them are just larger brooks but some are over a hundred metres wide. The greatest river is the mighty Danube which brings its waters to Croatia only by a small part of its long flow from Germany to the Black Sea. All of them, more or less, inundate flood-meadows and flood forests, among which are Kopački rit and Lonjsko polje. They store flood water and thus prevent floods. Also, they are rich wetland habitats. 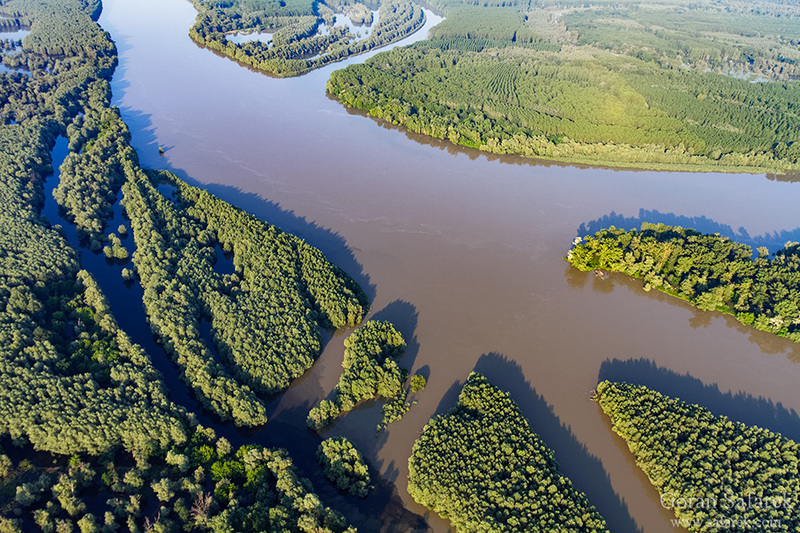 The Drava and the Mura still have numerous sidebranches and stagnant oxbowlakes, the key features that distinguish live and dead rivers. Such wetlands are of major importance as centres of biodiversity; on steep eroded banks rare and endangered bird species make their nests, such as kingfisher, sand martin and bee-eater. Sandbars and gravelbars are homes of terns, plovers, sandpipers and other birds. On the coastal side of great Dinaric Mountains, rivers that discharge into the Adriatic sea. They are not as long as the rivers in Pannonia, although they can meander around mountains all along. The short flow of the Krupa river, whose length is hardly seven kilometres, offers many natural values which cannot be found on many our larger rivers. Almost all of them flow on the karstic terrain, here through rough canyons, there through rich, green karst fields just. Sometimes it is hard to understand where that water is coming from, considering the dull surroundings. 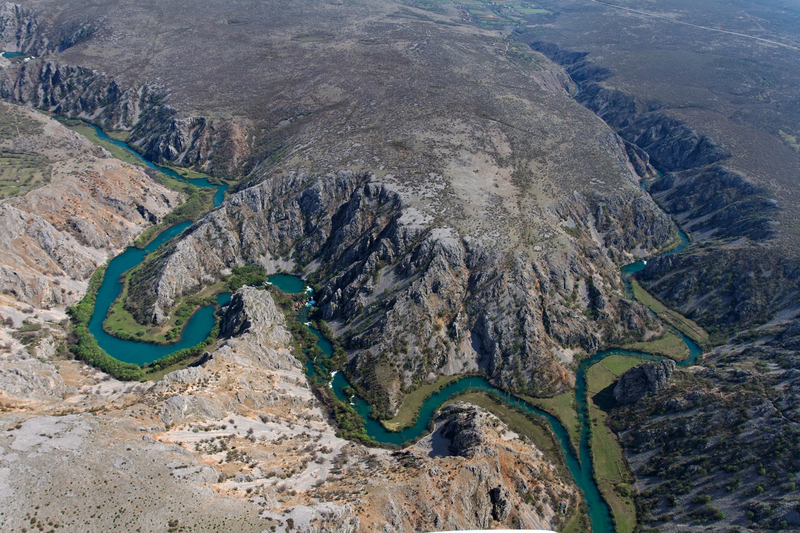 The Krka or the Zrmanja are lonely oases of life in the wilderness of North-Dalmatian plateau. Moreover, in the middle of karst there are small green meadows that the local people call „luke“, with willows, aspen trees, even lilies, reeds and other aquatic plants. The swampy conditions in this biotope occur because rivers, or at least their parts, often form slow and lake-like pools. 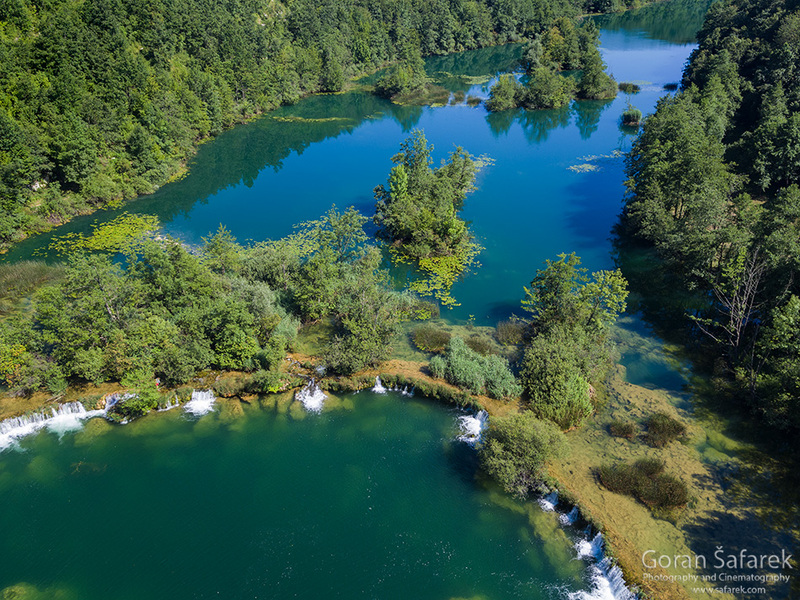 Sometimes even great lakes can be formed, like Lake Visovačko (Visovačko jezero) on the Krka River. Travertine (tufa) is as important here as in the rivers of Karlovac. In Dalmatia travertine has formed some of the most spectacular cascades. The waterfall Skradinski buk on the Krka River is considered the longest series of cascades in Europe, and it is surely one of the best known and most visited. A considerable part of the watercourses belonging to the Adriatic drainage basin flow through deep canyons that they have been hollowing for millennia. These canyons will lead them to the estuaries and deltas and then they will drain into the Adriatic Sea. The boundary between the sea and fresh water is actually hard to define here and it is more horizontal than vertical. The sea moves inwards along the bottom of the estuary while fresh water flows above it, in the opposite direction. There is one river which does not fit this description: the Neretva. It would look just like a typical lowland river, if it were not for those karst mountains and hills all around. It is the realm of reeds, aquatic birds, and soft soil. In so specific and diversified conditions, isolated from other fresh water flows and drainage basins, Adriatic rivers contain some animal species that cannot be found anywhere else, such as Salmothymus obtusirostris, ”evil mouth trout“. The proximity of the Adriatic Sea as a favourite tourist destination for large numbers of holiday makers gives them more and more value for tourism. The Krka has been well-known for a long time, thanks to the isle of Visovac, cascade Skradinski buk, watermills and cultural heritage. 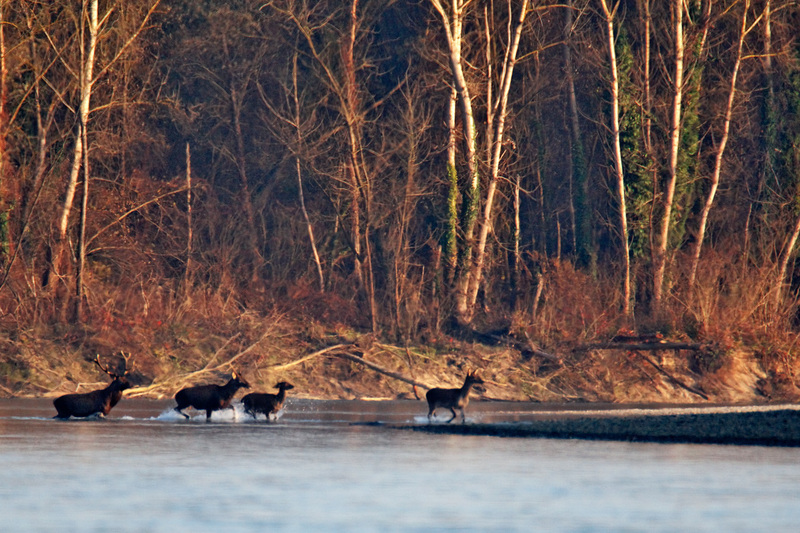 However, other rivers have recently become more and more popular, especially in terms of sport tourism. The Zrmanja and the Cetina offer adrenaline entertainment, while other rivers are appreciated as a place where one can enjoy nature and experience some refreshment after tanning on a beach. Scardinius dergle is a species of ray-finned fish in the family Cyprinidae. It is found only in Bosnia and Herzegovina and Croatia.